I liked American Hustle but, ultimately, thought it was overrated. 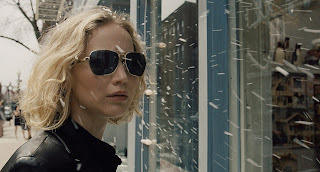 I like David O Russell as a filmmaker but I wasn’t really looking forward to Joy. However, I was pleasantly surprised…I liked it. Let’s get reel and break this down. O Russell delivers a story with a strong, inspiring female character surrounded with the brutal honesty of how business works. The writing was sharp and constructed one of the best characters of the year. The tone was consistent and had the usual O Russell flair with the looks and cinematography of American Hustle, heart of Silver Linings Playbook, and sense of family of The Fighter. This is a nice combination of them. The way the film starts is kind of a weird introduction and it kind of made me worry, but honestly, after the hump of the first ten minutes I was locked into the characters and story. This didn’t really bother me but I need to mention that all the characters, besides Joy, are unlikeable. However, I can see why they are written that way; they are meant for motivation for Joy and it does add a sense of realism. This was the best character I have seen Jennifer Lawrence play in terms of character development and the overall arc. There was so much realism, drive, and humanity to this character that I thought I was watching a real life person. The supporting cast does a great job throughout the story, even though they are not necessarily likeable. The camera framing and movement from O Russell films are always kinetic adding to the excellent pace of the story and the film overall, and this film is no exception. He has a clear homage to Scorsese from his past two films and this is another one that is in that category. With its interesting story and main character and its fast paced cinematography, this film flies by and I found myself rooting for Joy throughout. The first ten minutes and the opening shot/scene are bumpy and a bit strange, but that is a minor complaint, even though I was worried when it opened with it. This is an engaging story of a strong, passionate character chasing her dreams and that is infectiously inspiring. This was a nice surprise and I would recommend it. Will it be in my top ten? No, but I am glad I enjoyed it as much as I did.